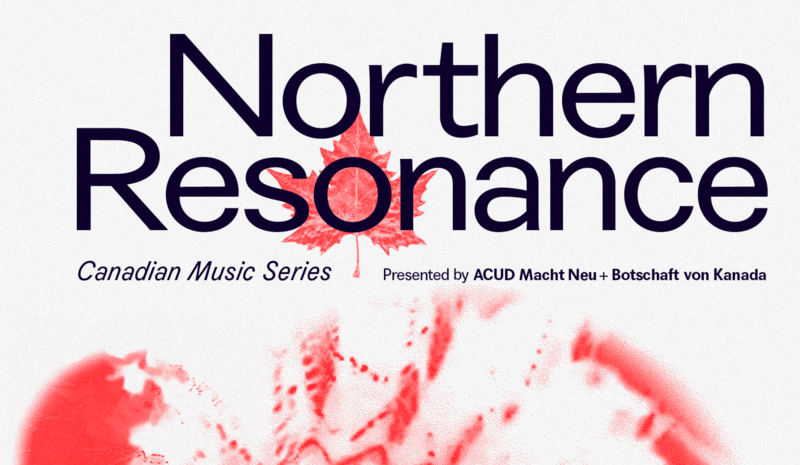 We are happy to announce The Northern Resonance Canadian Music Series. This program which starts this Thursday is supported from the Botschaft Von Kanada and features a selection of Canadian artists and music-related films, to share the depth, scope, history and future of the nation’s rich music culture with the city of Berlin. Each edition is a reflection of Canada’s position on the world stage as a vital and active contributor to the arts. We asked our booker Shub Roy who came up with the idea for this great series to answer us a few questions about Northern Resonance. Hey Shub, the Northern Resonance series looks awesome! Could you tell us more about it? The Northern Resonance series showcases a selection of contemporary Canadian musicians and one film featuring Canadian musicians (made by a Canadian director), in order to share a diverse range of Canadian music with the city of Berlin. The series has been curated by me, with support from the Embassy of Canada in Berlin. Some of the artists are more widely known (such as Sarah Neufeld from the Arcade Fire), while others are more obscure (such as the experimental group The Nihilist Spasm Band, featured in the documentary “What About ME”) and other ones are on the rise internationally (Sarah Davachi, Yamantaka Sonic Titan, Kara-Lis Coverdale). How many dates are planned? Could you give us a brief overview what’s happening? It’s not just showcases right? The Nihilist Spasm Band are an improvisational experimental group which began in the 1960’s and continues until this day (last year they even played a concert at the No! Music Festival at Haus der Kulturen der Welt, joined on stage by Alexander Hacke of Einstürzende Neubauten). The film traces the development of the group, from its origins in 1965 as a response to ultra-conservative London, Ontario, Canada to the tragic death of one of its founding members, artist Greg Curnoe, to their tour of Japan. It features interview with famous fans, including Thurston Moore of Sonic Youth and Canadian artist Michael Snow. Sarah Davachi is an electronic musician, who holds a bachelor’s degree in philosophy from the University of Calgary and a master’s degree in electronic music and recording media from Mills College. As a composer of electronic and electroacoustic music, Davachi is engaged in practices of analog and modular synthesis, psychoacoustic manipulations, multi-channel sound diffusion and studio composition. She will host an artist talk that will illuminate the phenomenon of psychoacoustics and to discuss its creative use in experimental music, giving insight into her own compositional process and explain different methods she employs in both recording and live performance. This talk will be followed by a concert. Kara-Lis Coverdale, also known as K-LC, is a Canadian composer, musician, producer, based in Montreal. Coverdale is known equally for her piano, organ, and keyboard work as she is for her experimental electronic projects; often her work integrates the two, blurring the lines between traditional composition and research-based modernism. She will perform a special piano concert at Bonello Tonstudio in Wedding (U8 Panstrasse) which has been chosen due to its grand piano and exceptional acoustic qualities. Sarah Neufeld is a violinist and composer based in Montréal, Canada. Best known as a member of Arcade Fire, she is also a founding member of the acclaimed contemporary instrumental ensemble Bell Orchestre, and most recently as half of an exciting new duo with renowned saxophonist Colin Stetson. Neufeld began developing pieces for solo violin in a formal sense in 2011, though she has made improvisation and solo composition part of her process and practice since first picking up the instrument at a young age. Yamantaka Sonic Titan is a Noh-Wave prog collective, a black-and-white (and sometimes red) theatre company, an operatic psych cult, and the speculative prophets of humanity’s impending doom. Live, the band can be sprawling and theatrical or concise and visceral, filling the stage with noise, melody and cacophony. The group features members of Asian diasporic and Indigenous Canadian descent, creating a very unique blend of western musical genres and elements of their respective backgrounds. Who are Canadian musicians we all should know about?